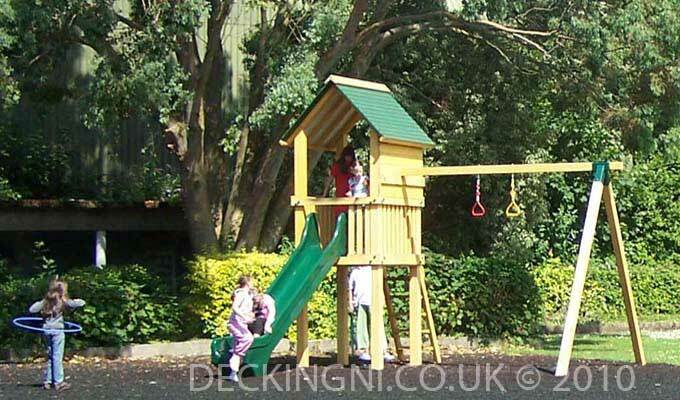 The Castle Discovery (Tree House) complete, Climbing frame complete, The ladder to the castle, 2 x plastic safety swing seats, Monkey Bars, Punch bag (children's), Slide green (reinforced polymer), Climbing Rope (knotted), 4 x galvanised ground anchors. 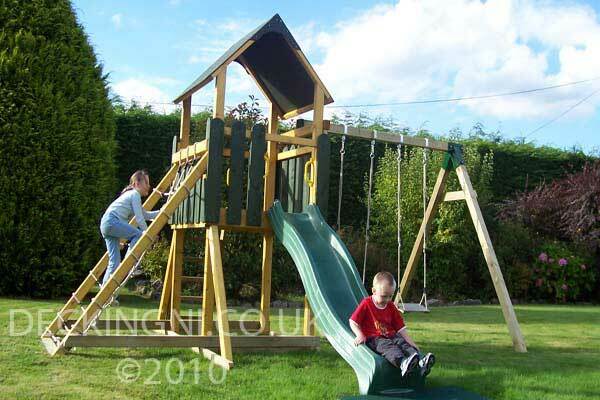 The Castle Discovery (9 in 1) complete has 9 activities in 1 climbing frame. 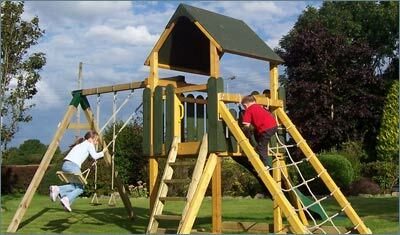 This is more activities than all of its competitors in this price bracket for garden play equipment. The Castle Discovery (9 in 1) complete represents excellent value for money. 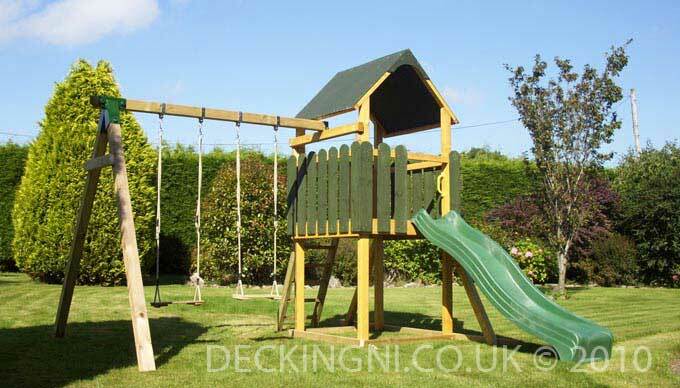 The combination of colours (dark green & pine) complement the natural look & design of the Castle Discovery, making it a very attractive garden play centre. 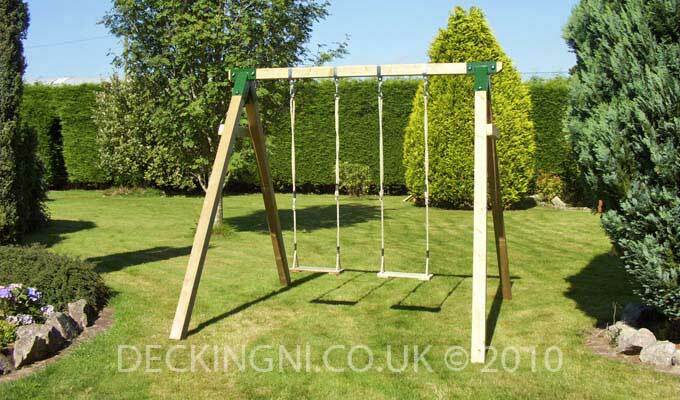 The sturdy construction is stronger than virtually all other residential garden play centres or garden play equipment on the market. 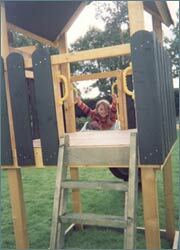 For strength, all of the timber used is large section Scandinavian whitewood. 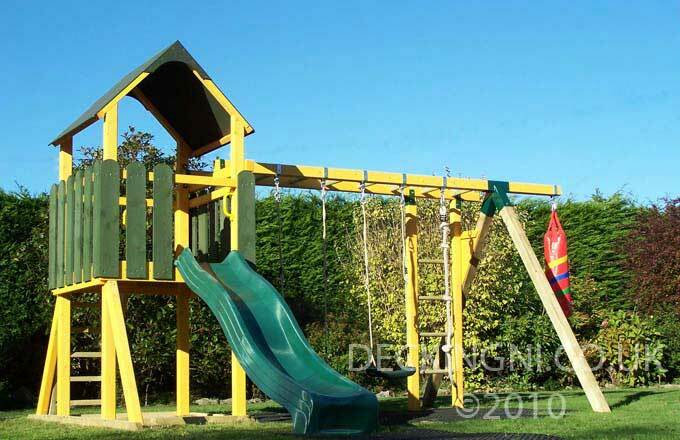 All corners are rounded for extra safety.All of the timber used in the manufacture of the Castle Discovery garden play centre is pressure treated to ensure a long lifespan of the play system. The roof system (with a pitch of 45 Degrees) is made from solid marine plywood and coated with an expensive plastic based sealant (The same sealant is used for sealing and protecting timber cladding on houses in the USA). The incorporation of the army type scramble net into the main system is unique. 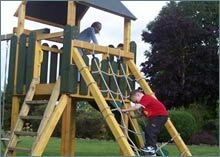 There are 2 ways to get into the Castle: Option 1 climb up the ladder, Option 2 Scramble up the scramble net and drop into the Castle. The most popular way down is down the slide. 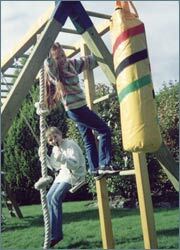 The Castle Discovery "Adventure" (with Scramble net) design is quite a challenge to younger children. 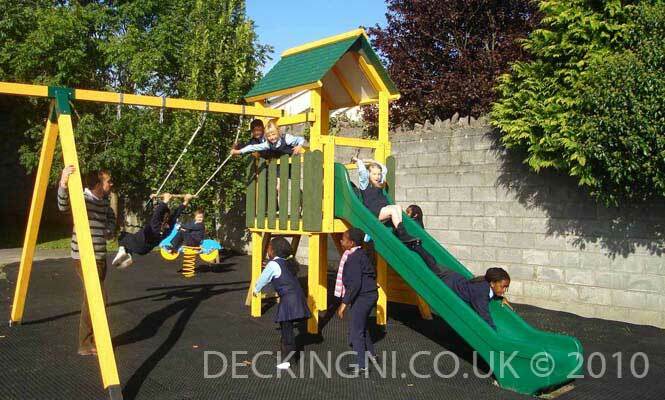 All corners are rounded for extra safety & all timber components are pressure treated to ensure a long lifespan of the play system.